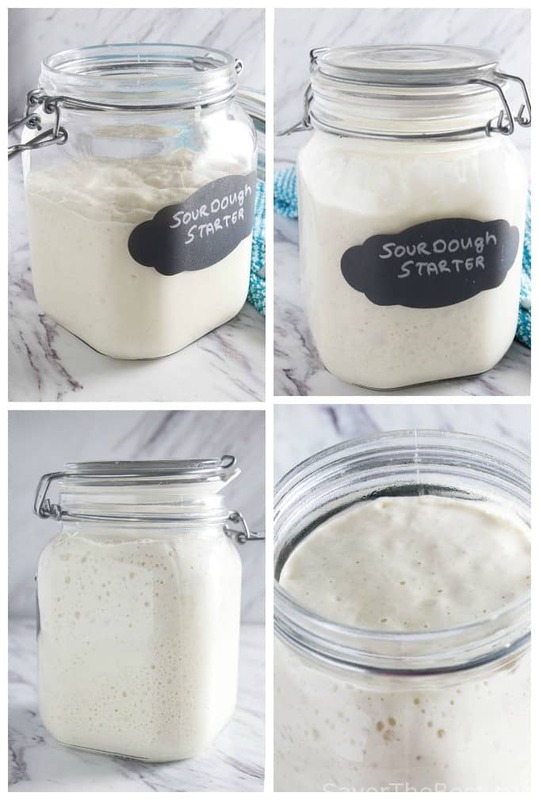 A sourdough starter is the first step to making authentic sourdough bread. 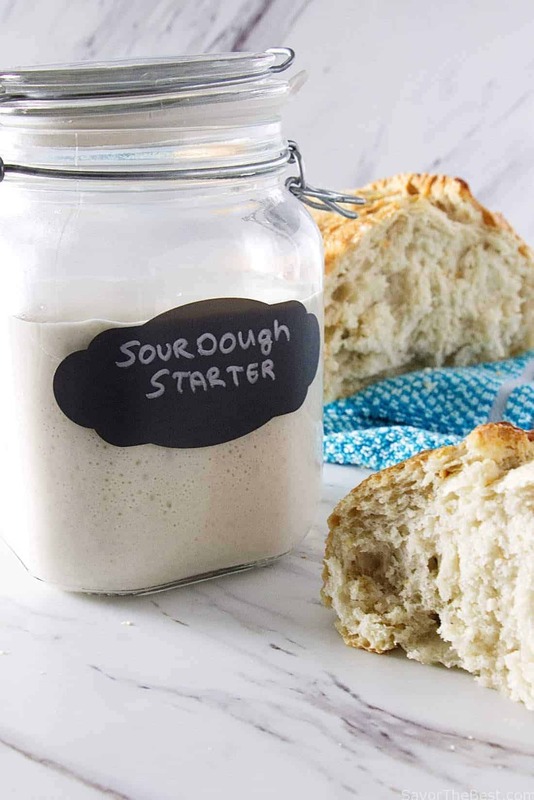 Creating your own sourdough starter is easy, and with proper care, it can last for years. This recipe uses pineapple juice to help give the initial growth of wild yeast a headstart. A wild yeast sourdough starter is flour and water left to ferment. The mixture absorbs the wild yeast and probiotic bacteria that is naturally in the air we all breath. After 6 to 12 days, the starter cultivates enough wild yeast that it will allow bread to rise without the addition of store-bought yeast. The slow fermenting process gives the starches and gluten time to ‘pre-digest’ in a sense. The sugars and starches are converted into carbon dioxide while the gluten turns into lactic acid. During this process, the bread acquires a mosaic of flavors and a distinct tang. It also makes the bread healthier and more comfortable to digest. Making sourdough bread is an ancient practice that was prevalent until the mid 1800’s. In our fast-paced world of instant gratification, the tradition has lost some momentum. With that said, it has not lost its appeal. Sourdough bread is not only known for it’s distinctive and complex flavors, but it is also a much healthier bread to eat and easier to digest. Perhaps the changes in how we bake bread have been a contributing factor to the rise of gluten intolerance? What is the Pineapple Juice Solution? 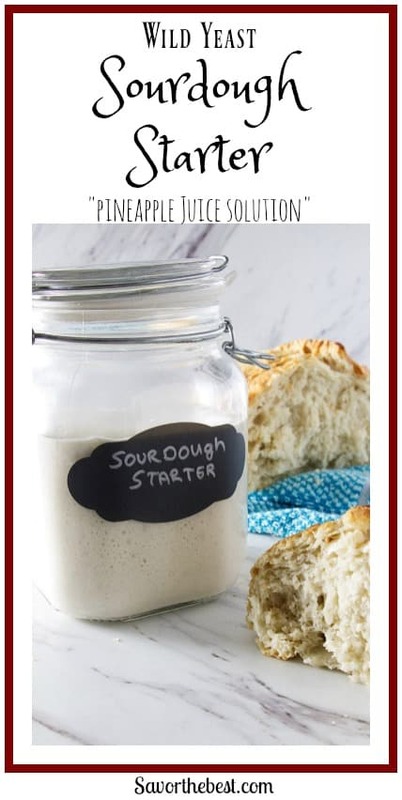 This wild yeast sourdough starter uses pineapple juice for the first two to three feedings. I learned about this technique in Bread Revolution by Peter Reinhart, but he gives credit to the microbiologist, Debra Wink. In Debra’s article on The Fresh Loaf, she explains how this method is a more reliable and “foolproof” method of getting the right bacteria and yeast to grow. Essentially, it lowers the pH in the beginning stages of developing the starter. The lower pH creates an optimal environment for the wild yeast to flourish. After the first two or three feedings, you can switch to water. After several feedings, the pineapple juice will eventually dilute out completely. Starting with pineapple juice isn’t necessary, but it ensures the success of cultivating wild yeast more efficiently while preventing unwanted bacteria. If you are allergic to pineapple juice, Debra mentions that you can use orange juice or apple cider. The point is to use an acidic liquid that will lower the pH enough to give the starter a nudge in the right direction. For sanity sake and cost consciousness, I tend to stick with a sourdough starter made with all-purpose flour. Discarding a portion of starter made from a more expensive flour is painful. However, when I know I’m throwing out a cheaper all-purpose flour, it doesn’t break my heart. When I want to make a sourdough bread using a more expensive flour, I simply start feeding my starter with the flour I want to bake with about 3 or 4 days before baking. A sourdough starter is actually quite easy to make and forgiving to occasional neglectfulness. The recipe for this sourdough starter is a 100% hydration (the first couple of days it will be at 200% hydration) and yields a moderate consistency. It will be about the thickness of muffin batter. Starters can be thicker or thinner and still work equally well. If you haven’t worked with a sourdough starter this is a great spot to begin. You will eventually find what works best for you. Some bakers keep their sourdough starter so stiff that they have to knead it during feeding times. This starter is simple to maintain, just give it a good stir. Once the starter is mature, you will want to keep it alive and fed. When it is time to feed it, transfer 1/4 cup to a clean container and discard the rest, then add 1/4 cup water and 1/2 cup of flour to the starter. If you have a digital scale, the process is much easier. 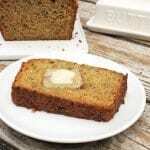 You will feed it at a ratio of 1:1:1 by weight which comes to 60 grams starter, 60 grams water, and 60 grams flour. If you will be baking bread frequently, then leave the sourdough starter on the counter and keep it fed twice to per day. The room temperature and type of flour will be factors in how often you will need to feed the starter. You may find that your starter will only need to be fed once a day in the winter and three times a day in the summer. If you won’t be around to feed the starter then just stick it in the fridge. If you are not going to bake bread very frequently, you can retard the starter by placing it in the fridge or even the freezer. I recommend you keep the starter in the refrigerator and feed it once a week if you will only be baking a couple of times a week. If it is going to be more than a couple of months before you plan to bake with it, I would recommend freezing the starter. As long as it is frozen, it will be in ‘hibernation’ and will not require any feeding. The Joy Kitchen has some great tips for keeping a sourdough starter longterm. They even include tips on using your starter to replace commercial yeast in a recipe. If the starter begins to separate and gets a brown liquid on top or if it smells like paint, don’t worry. That is a sign that your sourdough starter is hungry. Just give it a couple of feedings, and it will be as good as new. Why Should You Discard Part of Your Starter? You have to feed your starter every day, but before you feed it, you will want to discard part of the starter. I know it is hard to throw out perfectly good food and it seems wasteful. Truthfully, you don’t have to throw it out. You have some options. First, if you want to make a larger portion of starter, you could simply feed the starter without tossing any of it out. Keep in mind that to give your starter the proper amount of food, you will need to double your starter each time you feed it. So, if you start with 1 cup of sourdough starter on the first day of feeding, you will end up with two cups. That sounds reasonable. However, by your next feeding you will have 4 cups and then 8 cups at the next feeding. You can see that this can get out of hand very quickly. Unless you are running a commercial bakery, you really don’t need more than a cup of starter. Sometimes I keep two cups of starter on hand if I know I will be baking several things, but when I am not baking much bread then I only keep about 1/2 cup to 1 cup. The second option is to find something useful to do with your ‘discarded’ starter. Pancakes, waffles, and flatbreads are all great options. You could even add it to chocolate cake or banana bread for a twist on flavor. Another thing you can do to limit the amount you waste is to maintain a smaller amount of starter. You really only need to maintain about 10 to 20 grams of starter. If this is all you are maintaining, you will only need to discard about a tablespoon of starter during feedings. Once you know you will be baking, you can build your starter up until you have the amount you need for your recipe. For example, if you have 20 grams of starter and your recipe calls for 40 grams, do not discard any starter. Just feed it 20 grams of flour along with 20 grams of water. By the end of this feeding, you will have a total of 60 grams. That’s enough starter for your recipe as well as enough left over to save and maintain. Keep in mind you always want to save enough to continue maintaining your starter. If you do this, you will have a forever-friend that will give you incredible bread. 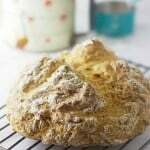 When Can I Use My Wild Yeast Sourdough Starter to Make Bread? You will want to let your sourdough starter develop for at least a week before you start baking with it. However, the older your starter gets, the more complex the flavor will get. In addition, letting it age will also allow it to build some strength. 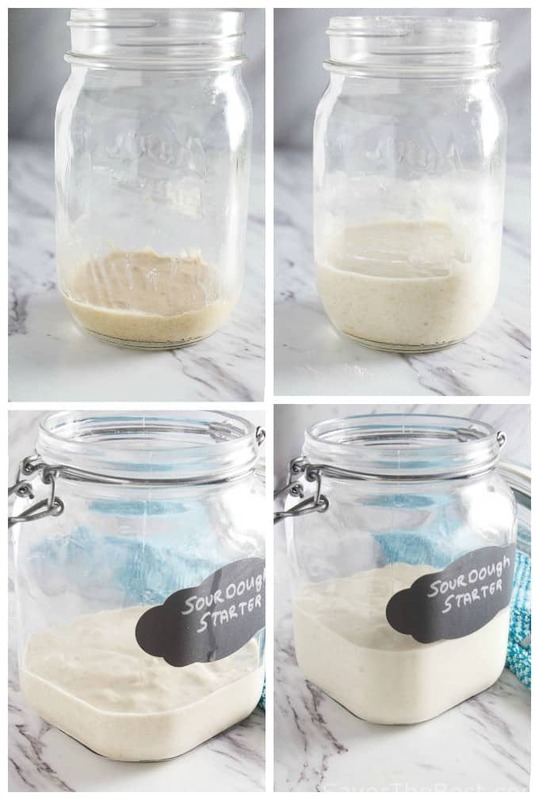 Your sourdough starter will perform better at 14 days than at seven days. Once your starter has matured for about two months, you will really notice a difference in the flavor of your bread. But What is the Best Stage to Use Your Starter in a Recipe? The best time to begin using the starter in a recipe is when it has risen to its peak. This is the point that it has risen all the way and before it begins falling. It isn’t a hard and fast rule but that is when the starter is at it’s strongest. With that being said, I have used it within a couple of hours of feeding it, when it just begins to rise. I have also used my starter several hours after it has reached its peak and fallen back down. If you are just getting started with a wild yeast sourdough starter, I recommend you use the starter when it has reached its peak after a feeding. It should be full of bubbles and look spongy. Once you get the hang of baking with your sourdough starter you can experiment a bit. Using the sourdough starter soon after feeding will result in a milder tasting bread. On the other hand, using long after it has peaked will give your bread a more tangy flavor. How Do I Use My Starter If I store It In The Refrigerator? 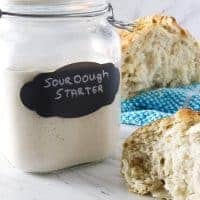 If you’re storing your sourdough starter in the refrigerator then you will want to remove it from the fridge the night before you mix the dough. Use the amount called for in the recipe to make the pre-ferment. Then feed and refrigerate the remainder of your starter. In the morning, carry on with the rest of your recipe using your pre-ferment. If your starter has been sitting for too long between feedings, it might have a layer of liquid on top called hooch. If this is the case, you will want to plan a couple of extra days in advance to revive it. After 3 or 4 feedings, it should be good to use in your recipe. If you only have a couple of tablespoons of starter on hand, you will want to build it up. Take your starter out of the fridge a couple of days before baking. During the feedings don’t discard any starter. Keep feeding every 12 hours until you have enough to use in your recipe. That’s all there is to it. You can get much more technical, but this will get you started. Eventually, you will find your own rhythm and come to love your wild yeast sourdough starter as if it is a pet. Mix the flour and pineapple juice in a small jar or bowl. Stir the mixture 2 or 3 times throughout the day to mix air into it. Stirring the starter several times a day for the first few days will help get air to the yeast which will help the yeast grow better. Keep it covered with a paper towel or coffee filter. Keeping it covered loosely with a paper towel will allow the starter to breath in the yeast that is in the air but will prevent dust or possible flying critters from entering. Add the flour and pineapple juice to the existing starter and give it a good stir. Stir the starter 2 or 3 times throughout the day to get it aerated. Keep the starter covered with a paper towel or coffee filter. You probably wont notice any activity at this point but have faith that the invisible microbes are doing their work. Add the flour and pineapple juice to the existing starter and give it a good stir. By this time you might be seeing a bit of activity in the form of bubbles. Starters in some kitchens might need a day or two longer before seeing activity. Don’t worry if yours isn’t active yet. Discard all but 1/4 cup of the original starter and add the 1/4 cup water and 1/2 cup flour. The process is much easier if you have a measuring scale but it works just fine if you only have measuring cups. At this point you will want to keep the starter in a quart jar or any container that holds at least 4 cups. This will give the starter room to rise without spilling out of the jar. Continue the same feeding regimen as on day 4. It is likely that you will need to increase the feeding regimen twice a day. If it doubles in size within 12 hours then feed it twice per day. If you will not be baking for a while then stick the sourdough starter in the fridge and feed it once per week at a 1:1:1 ratio. by dumping out all but about 1/2 cup of sourdough starter (about 60 grams) and feeding with 1/2 cup flour (60 grams) and 1/4 cup water (60 grams). Once your ready to bake bread, take the starter out of the fridge 1 to 3 days before baking and feed it twice a day, giving it time to come out of hibernation. For best results, we recommend starting with a whole grain flour for the first and second day. Whole grain flour has more nutrients and microorganisms than white flour and will give your starter an extra ‘boost’. If you start with white flour it will still work but might take a day or two longer to see activity brewing in the starter. We also recommend using non-chlorinated water because chlorine can kill the wanted yeast and bacteria, thwarting your results. Do not store your starter at temperatures over 78°F or you could encourage bad bacteria to breed in the starter. Do not feed your starter pineapple juice or any other acid after the first three days. An established starter does not need the acidic environment and the extra acidity could kill the starter. The longer you keep your sourdough starter, the more flavor it will develop. Usually, after you have been maintaining it for a month or two you will notice a distinct difference in flavor so give it some time. Does the pineapple juice have to be unsweetened or would the juice drained off canned pineapple work just as well? What a terrific post! SO informative and useful. We’ve neer worked with a sourdough starter — really should try it. Thanks for the inspiration!